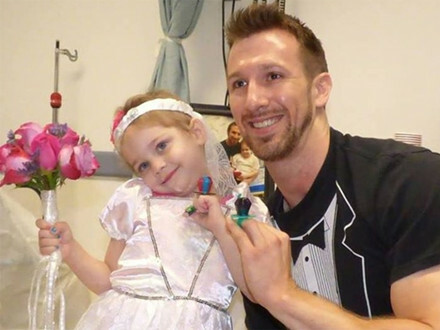 A child battling cancer "married" her favorite nurse in a simple ceremony held at the Albany Medical Center (AMC) in New York, where she usually goes for treatment. The event was complete with flowers, cake and a toy car that has a "just married" sign. Four-year-old Abby came in for her treatment on Thursday, July 16 at AMC. Little did she know that her dream groom and a sweet wedding ceremony were about to surprise her. Abby was dressed in a white gown and carried a of pink and purple flowers. Her mother walked her down the aisle as nurse Matt Hickling, who donned a shirt a , awaited. The officiator of the wedding was Abby's doctor, Dr. Jennifer Pearce. Abby, who was diagnosed with Pre-B Acute Lymphoblastic Leukemia, has been telling her mother all week that she wanted to marry her favorite nurse, Matt. The mother then told Matt about Abby's wish and said yes instantly. Soon after, Matt and the medical staff started preparing for the "wedding" and in less than 24 hours, everything was arranged. 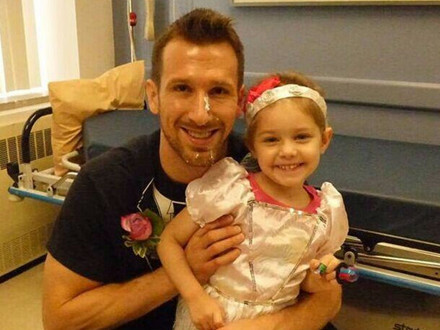 "Our patient shyly asked me to marry her," Matt wrote on his Facebook page. "I didn't hesitate to say yes, I got a HUGE hug and we sealed the deal with ring pops being placed on our fingers!" Abby and her mother were delighted and felt blessed to have such people in their lives. According to Abby's mother, her daughter told her that it was the best day ever, as posted on the Amazing Abby Facebook page. Acute (ALL) is the most common type of cancer among children and accounts for about 25 percent of all cancers in children aged 15 years and below.